2.9 million fewer students have enrolled in college since the enrollment peak in 2011, reflecting a shift in priorities for recent high school graduates. With Generation Z (Gen Z) entering college, schools must adjust their recruitment and retention strategies to address Gen Z’s concern that a college education may not be worth the cost. 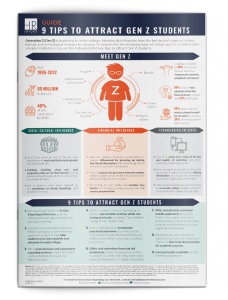 Our new infographic, 9 Tips to Attract Gen Z Students, helps institutions prepare for the incoming wave of college-age Gen Z students by outlining nine key tips to meet — and exceed — Gen Z’s college expectations.